Another year, another furniture fair. It was the 25th anniversary edition of the International Contemporary Furniture Fair at the Javits Center in New York. Every year I go and attempt to assess the state of the world by looking at sofas, chaises, coffee tables and wall coverings. The past couple of years were a little dull; the world, I decided, was in a holding pattern. (Here’s 2012 and 2009) This year, however, I detected an exuberance that I hadn’t sensed in quite sometime. The funny thing is that the upswing in mood had very little to do with the actual furniture on display. Yes, there were some cool pieces including new turntable consoles for the vinyl revival by Symbol, reissued Josef Albers nesting tables from AMEICO, and some great looking Konstantin Grcic chairs by Emeco. But the big excitement had to do with fabrication. 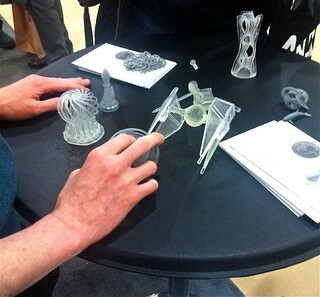 It’s one thing for digital fabrication to be on display at the reliably outre New Museum, and another for it to turn up much closer to the mainstream at Javits; clearly the maker movement has arrived. Most impressive was a cluster of several machines dead center on the exhibition floor, laser cutting and folding steel into Tom Dixon designed Punch Balls. Trumpf, a German manufacturer of high tech industrial equipment was in charge, assisted by Red Hook based metal shop Kanmetal. More than the tabletop sized 3D printers that were seemingly everywhere, spewing out fragile looking tchatchkes, Dixon’s metalworks struck me as a large, loud statement about the very nowish merger of design and manufacturing. 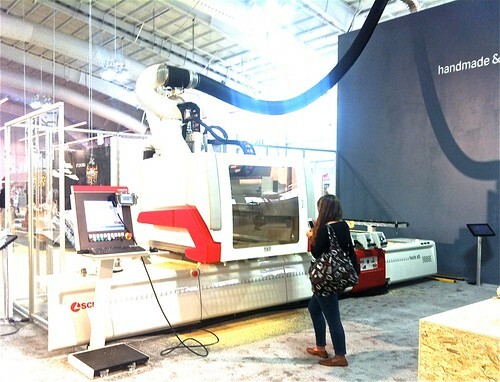 Then there was the huge CNC router set up in the middle of Javits North, an underpopulated annex, carving blocks of wood into smallish cars. I was too tired by the time I got there to figure who was fabricating what and why, but it was also a fairly dramatic operation. And there was my favorite thing, the very indulgent built-in espresso system called TopBrewer. 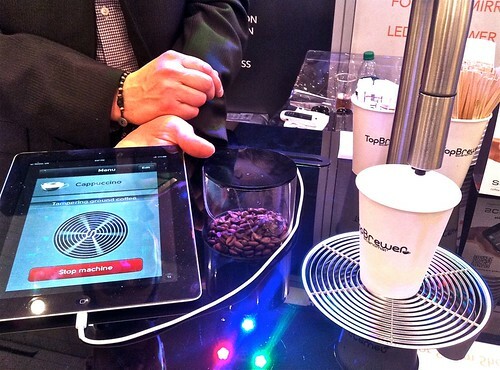 The machine (including a grinder) was built in to a counter, controlled by an iPad app, and delivered hot cappuccino out of a faucet. I’ve made endless jokes about my desire for an app that makes espresso. The set-up I saw at Javits comes very close to my fantasy and nicely represents a whole other spin on the concept digital fabrication.